IT IS a two-horse race — and a close one at that — for the top job at Petroliam Nasional Bhd (Petronas) between Datuk Ahmad Nizam Salleh and Datuk Wan Zulkiflee Wan Ariffin, sources familiar with the matter tell The Edge. Ahmad Nizam currently helms Engen Ltd in South Africa, an 80%-owned unit of Petronas, while Wan Zul is chief operating officer and executive vice-president for the downstream business of the national oil company. Ahmad Nizam, 59, is understood to have the support of the politically well-connected and the various Malay rights groups. However, the technocrats in Petronas and some members of the oil and gas fraternity are firmly behind Wan Zul. It is also learnt that current president and CEO Tan Sri Shamsul Azhar Abbas’ contract, which expired on Feb 8, has been extended only until end-July this year, giving him little leeway to tie up any loose ends before he leaves. “It’s odd that Shamsul’s extension is only until [end] July … why the rush? It’s a challenging time. Nevertheless, it’s a two-horse race basically — Ahmad Nizam and Wan Zul. They are the front runners,” says a source familiar with Petronas. There are two other candidates for the job — Datuk Mohd Anuar Taib, Petronas’ senior vice-president for upstream business in Malaysia, and new entrant Md Arif Mahmood, who is the company’s senior vice-president of corporate strategy and risk. While 48-year-old Mohd Anuar is deemed too young for the post, Md Arif, 52, could be hampered by a lack of exposure. “But you can never really say. If there is a deadlock between Wan Zul and Ahmad Nizam, it is very likely that a wild card candidate, either Mohd Anuar or Md Arif, could get the top appointment,” the source adds. Some say an announcement of Shamsul’s successor could be made as early as Feb 7, but there has been no such indication from Putrajaya at the time of writing. Shamsul has been at the helm of Petronas since Feb 4, 2010, and it has been an eventful five years. The job of safeguarding the country’s hydrocarbon resources is probably akin to walking a tightrope. Under his watch, the national oil firm made a few bold moves, many of which have made Shamsul unpopular. He sold off non-performing assets abroad to concentrate on the home front. He also kick-started the development of marginal oilfields and revived the oil recovery of mature fields. Shamsul awarded risk service contracts to foreign-led consortiums to develop small oilfields and set up Vestigo Petroleum Sdn Bhd, a wholly-owned unit of Petronas Carigali Sdn Bhd, to pave the way for Petronas to play a more active role in marginal field developments. While he was not well liked among the Malay rights groups and bumiputera-owned companies, he did have his fair share of supporters — he raised the bar for competition and allowed foreign companies to participate in tender bids for larger structures such as central processing platforms, thus forcing Malaysian companies to improve their game. Petronas also initiated the Pengerang Integrated Petroleum Complex, which includes the Refinery and Petrochemical Integrated Development project in southern Johor. The massive downstream project, slated to be completed in 2019, is expected to help Petronas climb the value chain. In June 2012, Petronas acquired Canada’s Progress Energy, which owns massive shale gas reserves. Petronas’ total investments in Canada could be a whopping RM120 billion. The acquisition has been criticised for its hefty price tag. Shamsul defended the purchase, saying that it will ensure a sustainable supply of natural gas — a key income source — for the national oil firm. Petronas offloaded its Vietnamese assets to home-grown outfit SapuraKencana Petroleum Bhd for US$400 million. RM300 billion over five years, which spurred interest in the sector. However, while he had done significant good, he did ruffle a few feathers and made what some say were untoward statements. A senior executive in a local oil and gas company points out that Shamsul had been quoted by the newspapers as saying the Malays lacked competitiveness, and had asked the government, which is Petronas’ shareholder, to tighten its belt as oil prices fell. “Maybe he pushed too hard,” he says. While some were mortified that he made such comments, others lauded him for having the guts to stand up to the government, and stand up for what he believed in. 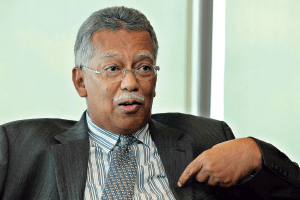 Despite having only a five-year reign at Petronas, Shamsul’s tenure is likely to be remembered — fondly or otherwise — by many in the industry.